Curtis Knight (real name Curtis McNear aka Curtis McNair)1 was already a music business veteran when he met Jimi Hendrix. Since Curtis used at least three different names during his career a lot of the recordings he made are less than well known. Here are the ones I currently know about, there might well be more. According to Kathy Knight-McConnell Curtis Knight also sang with the Love Notes.2 There could have been a misunderstanding here as according to Marv Golberg 5 Buddy Holt of The Statesmen was an ex-member of the Love Notes, the Statesmen in turn was a group that Curtis WAS a member of and they also performed Love Notes material. 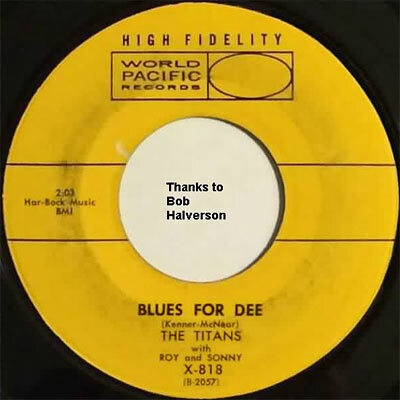 Between 1957-1960 Curtis recorded as a member of the The Titans. The band appeared in the 1957 film "Bop Girl Goes Calypso", a clip from this film with the band performing "So Hard To Laugh, So Easy To Cry" is available on YouTube (in the film Curtis Knight is 2nd from the right). "So Hard To Laugh, So Easy To Cry (CW) / Rhythm And Blues (CM)"
"G'wan Home Calypso (CM) / Look What You're Doing Baby (CM)"
"Sweet Peach (CM) / Free And Easy (SB)"
"Just A Little Lovin' (DD) / When The Sun Has Begun To Shine (DD)"
"Don't You Just Know It (SB/LG) / Can It Be (CM)"
"Arlene (SB) / Love Is A Wonderful Thing (SB)"
"I Swear By All The Stars"
"Everybody Happy (CM) / What Have I Done (CW)"
The Titans with Roy and Sonny: "Lonesome Mood (??) / Blues For Dee (??)" 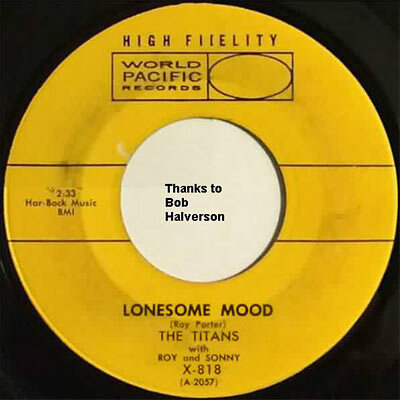 Listen to "Lonesome Mood" on YouTube. Thank you Marv Goldberg for the label scans. "Careless Love / Hawaiian Wedding Song"
7" (Ford Records 115) released 196? It's not possible (at least not for me) to tell Knight's vocal apart from the others but he does appear in publicity pictures so he definitely did sing in the group at some point. Hear "Hawaiian Wedding Song" & see a slide show of promo pictures on YouTube. Curtis released 4 solo singles co-written by Sampson Horton (who is also credited with producing two of the records) and co-wrote at least one track with Horton for other artists. 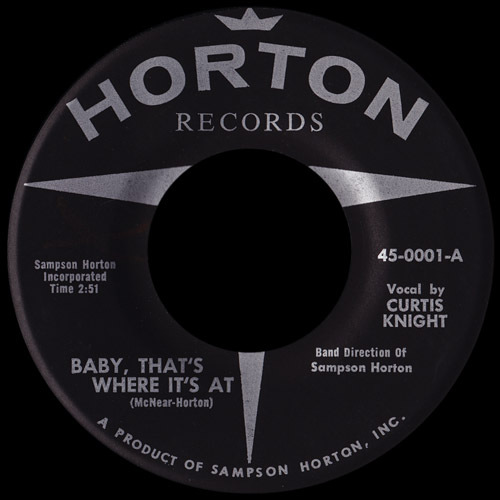 Curtis Knight: "Baby That's Where It's At / You Don't Have To Tell Me"
7" (Horton Records 45-0001) released 19?? This may be the earliest Curtis Knight "solo" recording released, amazingly I had no idea it even existed until Dave Jones kindly supplied me with a copy in February 2015. One online discography lists the release date as 1963 but I haven't found anything to back that up. The label name & catalog number suggest that this was the first release on a label launched by Sampson Horton and possibly the only one since I haven't found any other releases. So the only source of information that I have at the moment is the record itself. The composer credit is for "McNear". Curtis McNear was the name that Curtis used prior to taking the stage name Curtis Knight so this disc with the composing credited to Curtis McNear and a "vocal by Curtis Knight" might be the first "Curtis Knight" -record and perhaps predates the other singles done with Sampson Horton (which have no "McNear" -credits)? Curtis Knight: "Voodoo Woman / That's Why"
"Voodoo Woman" was reviewed in Billboard magazine August 28, 1961 issue: "Blues-oriented and folkish is this novelty. Chanter sings the lyric with extreme voice breaks and gimmicks." It also shows up as a first entry at 65. on the 22 August 1961 survey of New York radio station WABC. Listen to "Voodoo Woman" on YouTube. Listen to "That's Why" on YouTube. Bobby Keene: "Angel Or Devil / Gotta Go To School"
Listen to "Angel Or Devil" on YouTube. 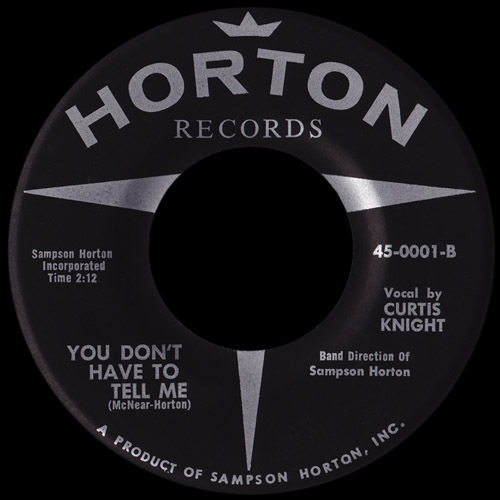 Curtis Knight: "You're Gonna Be Sorry / Little Doe-Doe"
"You're Gonna Be Sorry" was reviewed in Billboard magazine February 24, 1962 issue: "Fervid chanting by Curtis Knight and femme group on feelingful gospel-flavored theme with fast-moving tempo"
Sampson Horton & Curtis Knight. Curtis Knight: "Gotta Have A New Dress / When You've Got Love"
Listed under "Reviews of New Singles" in Billboard magazine October 27, 1962 issue. Later re-recorded with the Squires including Hendrix on guitar. Listen to "Gotta Have A New Dress" on YouTube. Listen to "When You've Got Love" on YouTube. All four of these solo singles were co-written and the last two also produced by Sampson Horton, any information about him would be most welcome. Curtis doesn't seem to have recorded anything between 1963-1964. It is of course possible (and even likely) that the information just hasn't popped up yet or that Curtis was a member of an unknown band during this time. "Ain't Gonna Be No Next Time / More Love"
"Infectious monkey sound with some fine harmonica support." "Blues ballad side with catchy drumming." The producing credits for this 45 go to Harold Thomas and Peter Orna (once again any info on these two gentlemen would be appreciated). After the first RSVP single was released Knight seems to have changed management again, this time hooking up with Ed Chalpin and his company PPX Enterprises, Inc. sometime in late 1965. Both RSVP and PPX were located in the same building, 1650 Broadway. Jimi Hendrix was introduced to Curtis Knight in the lobby of the America Hotel in New York. According to Hendrix himself he recorded "How Would You Feel" with Knight the next day, so this would date the meeting to have taken place on the 5th of October. Several studio sessions and live gigs followed until mid 1966 when Hendrix started his own group the Blueflame. The following two singles feature Hendrix on guitar, for details about the Hendrix & Curtis Knight -recordings see other sections of this site. "How Would You Feel / Welcome Home"
"Hornet's Nest / Knock Yourself Out"
After Hendrix reached fame with the Jimi Hendrix Experience Ed Chalpin sued Reprise Records and Polydor / Track Record for breach of contract, since Hendrix was legally still under an exclusive contract to Ed Chalpin. While the court process was still in progress Jimi (for reasons never properly explained) again recorded for Ed Chalpin in July & August 1967, working on Knight songs and participating in a jam session. Ed Chalpin later won the right to release all the studio recordings (the live recordings are a more complex case) featuring Hendrix, and he has been licencing these tapes to hundreds of companies over the last 30 years, creating the most confusing jungle of different mixes and edits of the material imaginable. Some of these solo Curtis Knight releases were put out by Polydor who were also Jimi's label at the time! Special thanks for info on all things Curtis Knight go to Nate Edmonds Jr., Doug Bell, Univibes and Jimpress. 1 postings by Kathy Knight-McConnell at snow-day.blogspot.com and www.myspace.com/memoriesofcurtisknight : "Curtis was born Mont Curtis McNear but changed his singing name to Curtis McNair early on (after his cousin Barbara McNair). When he left the service he changed his stage name to Curtis Knight, although in his very early years he used Curtis McNear." 2 postings by Kathy Knight-McConnell at snow-day.blogspot.com and www.myspace.com/memoriesofcurtisknight : "Curtis Knight sang with the Ink Spots, the Titans, the Love Notes and others"
14 YouTube clip of the single A-side posted by user "OfficeNaps", the description lists the personnel: ""Lonesome Mood"'s massive groove is orchestrated by Porter, with support from Sonny Kenner (guitar), Bob West (bass) and Joe Sample (piano). And the striking unison vocal lead and jazzy harmonies come courtesy of Titans Larry Green and Curtis McNear (who would later record as Curtis Knight); I believe Porter is also contributing to the vocals."